A New York gallery has angered a US Catholic group with its decision to exhibit a milk chocolate sculpture of Jesus Christ. 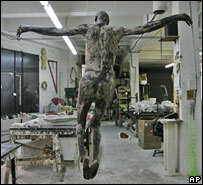 The six-foot (1.8m) sculpture, entitled "My Sweet Lord", depicts Jesus Christ naked on the cross. Catholic League head Bill Donohue called it "one of the worst assaults on Christian sensibilities ever". The sculpture, by artist Cosimo Cavallaro, will be displayed from Monday at Manhattan's Lab Gallery. The Catholic League, which describes itself as the nation's largest Catholic civil rights organisation, also criticised the timing of the exhibition. "The fact that they chose Holy Week shows this is calculated, and the timing is deliberate," Mr Donohue said. He called for a boycott of the gallery and the hotel which houses it. The gallery's creative director, Matt Semler, said the gallery was considering its options in the wake of angry e-mails and telephone calls. "We're obviously surprised by the overwhelming response and offence people have taken," he said. "We are certainly in the process of trying to figure out what we're going to do next." Mr Semler said the timing of the exhibition was coincidental. Mr Cavallaro, the Canadian-born artist, is known for using food ingredients in his art, on one occasion painting a hotel room in mozzarella cheese. He used 200 pounds (90 kg) of chocolate to make the sculpture which, unusually, depicts Jesus without a loincloth.